I finished the Blazing star quilt top today. I will still need to add some borders, but the hard part is done. 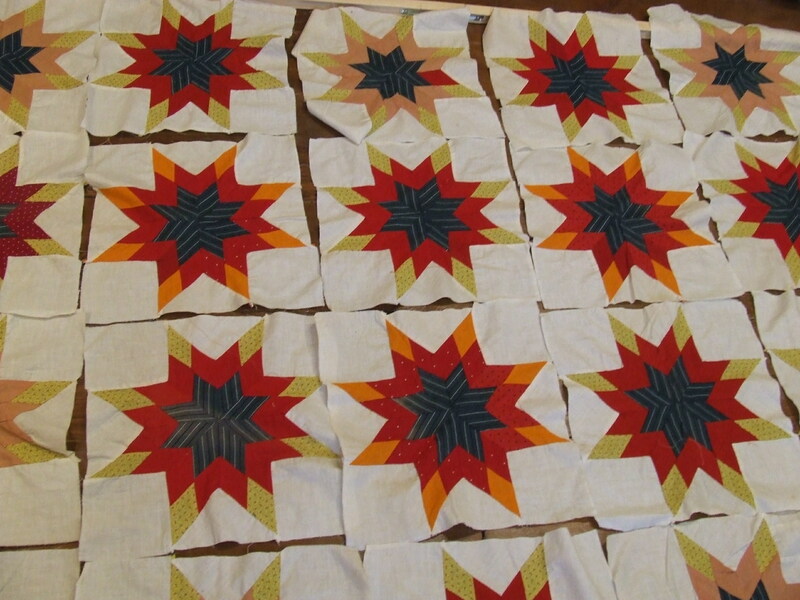 These are the antique blocks before piecing together. At one time before I got these blocks they were all sewn together. I have wondered why someone took the time to take them all apart but when I started working on them I knew why. They were not well made, and that means that they were not all the same size and they were not flat. I had to make a lot of adjustment in the seam allowances in order to get the points on the stars to match up. I had to draw a line from point to point to see where the seams should actually be. sometimes it meant a very large seam allowance and sometimes it meant a very small one. The wavy blocks added to the challenge. So I also had a lot of easing to do in order to make them fit together. I did this all by hand because I have a lot more control that way. I will need to decide on a border fabric for this. The top is about 60 X 75 now and I would like to bring it up to full size with borders. I think I will look for a red and a cheddar or maybe something to match the teal centers. The white squares formed where the blocks come together will be great areas for some fancy quilting! 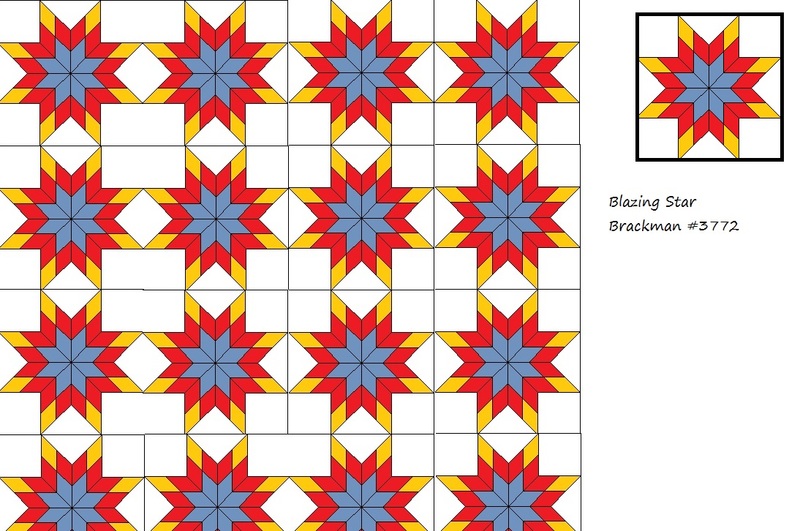 This entry was posted in Quilts and tagged antique quilt blocks, blazing star block, hand piecing, Quilts, vintage quilt blocks. I commend you for the patience it took to correct the seam allowances and extra fullness issues. It is beautiful, thanks to you. Apparently someone took it apart and when they saw the challenge required to put back together – said “no way”! Nice job. Thank you Tim for the lesson on how to put a quilt top together when nothing matches. I have been given a couple of these and have not started the process yet. I think I have been to stuck on conformity, which will not week. Thank you for your inspiring ways! I love the top by the way! The difference in light to dark blocks makes the quilt glow. So pretty. I really like the few blocks that have a random red diamond as well. You did a good job as usual explaining how to make irregularities work together and play nice. Great quilt top! 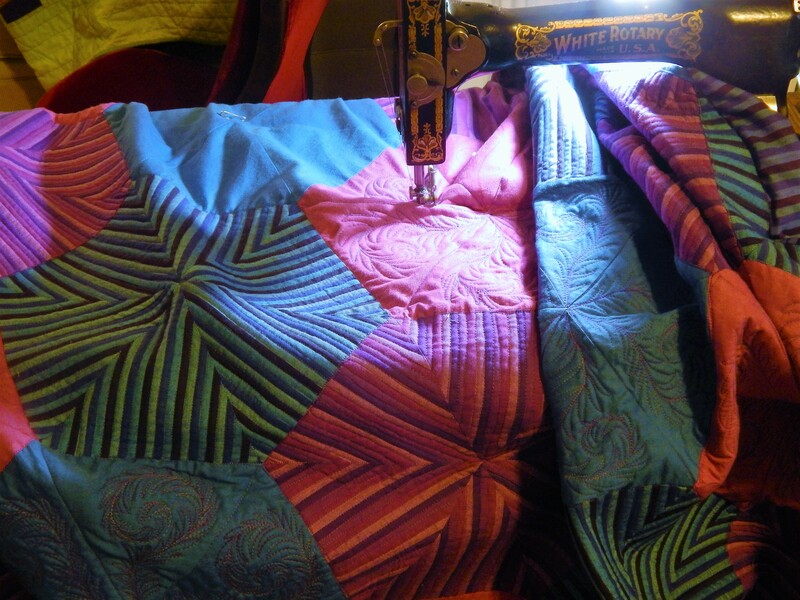 thats the best thing about quilts!….distance makes them look great! 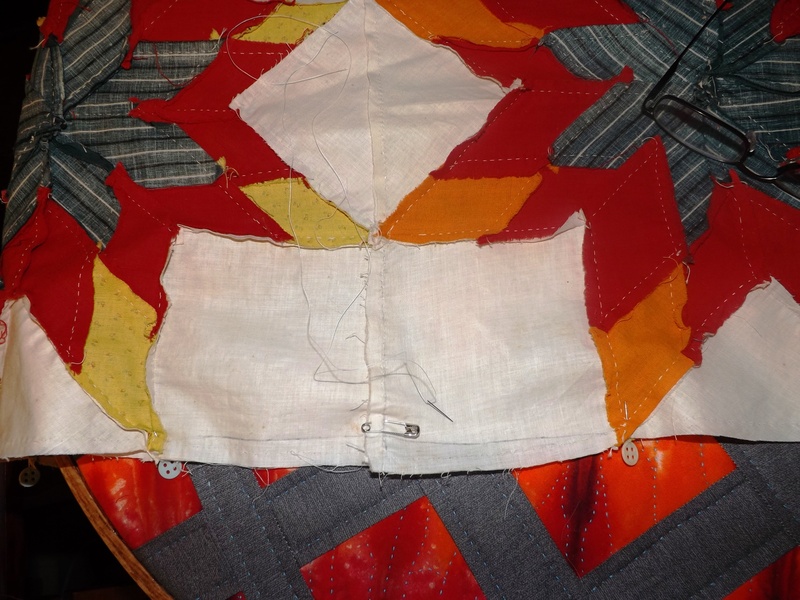 I have found that a lot of “unfinished” quilts are in fact rather poorly made. It’s easy enough to make all the blocks, but then when you go to put them together, all the discrepancies show up! 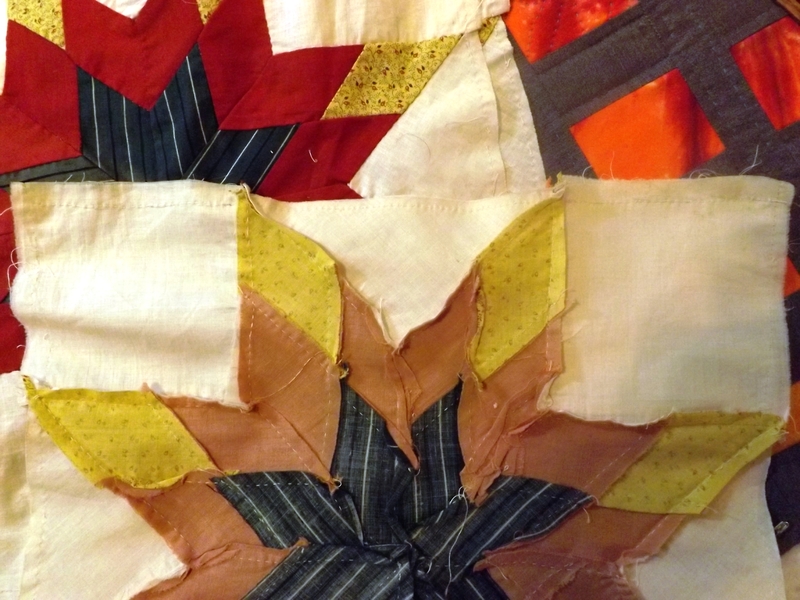 A group of us used to make Log Cabin quilts, marathon-style, for City of Hope patients and an orphanage. 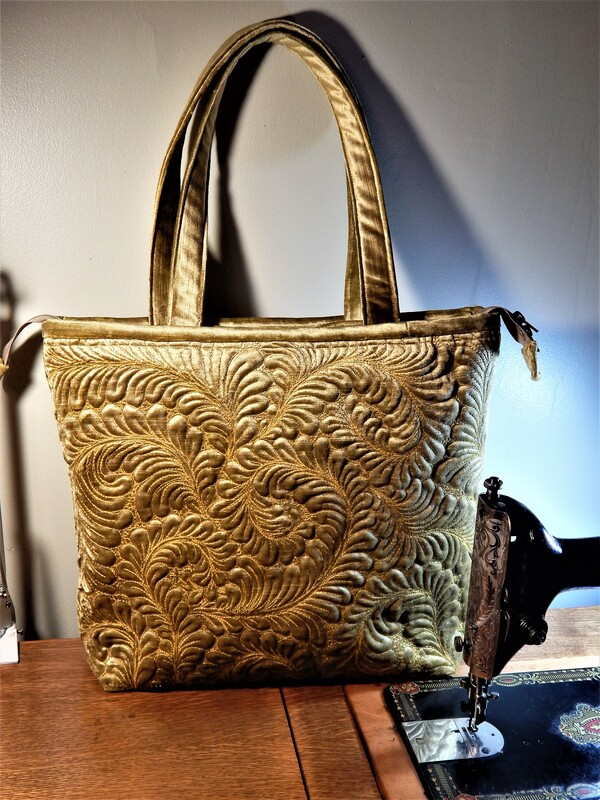 My job was to put them together–even with everyone working with the same materials, there would often be up to an inch of difference! 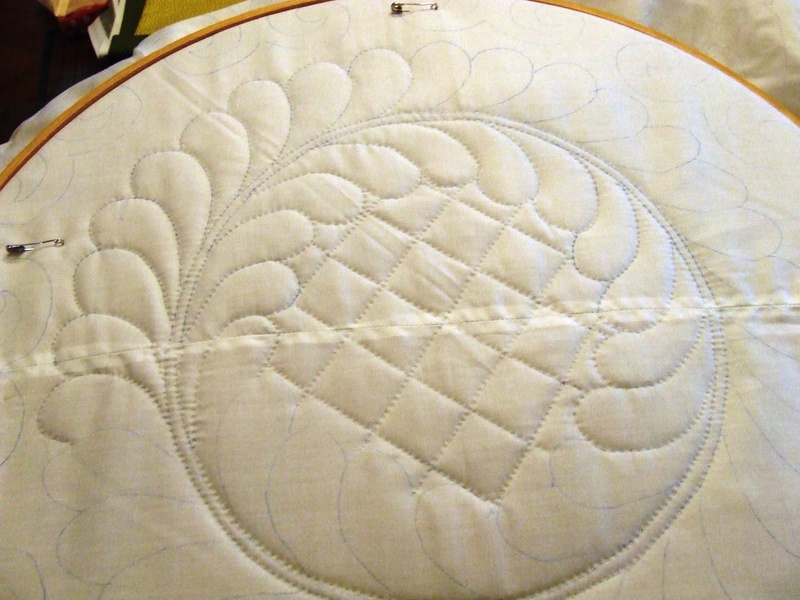 I could do it, and the quilter (who was a newbie longarmer) would work in any puckers. 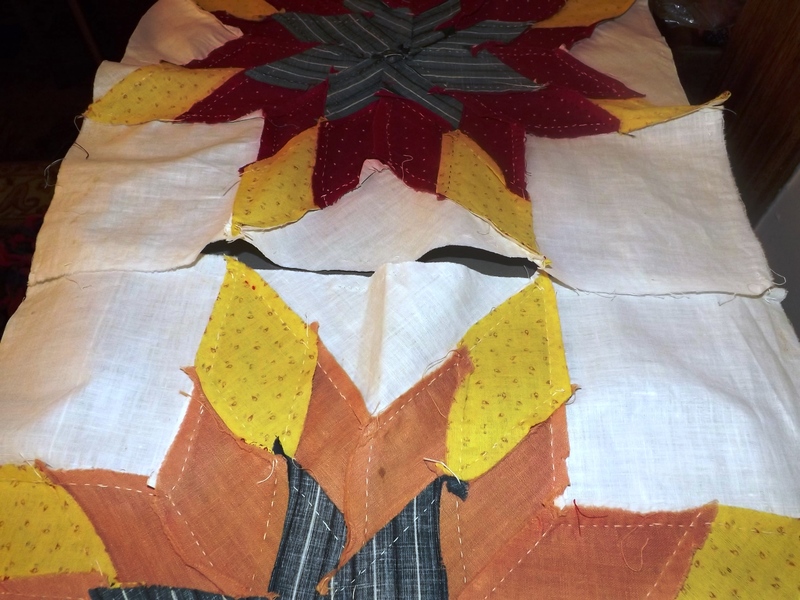 We made well over 300 quilts–lots of practice! Very different from the heirloom quilts I work on hand-quilting, but sometimes it’s nice to just let go and fly! so true…everyone seems to have a different 1/4″..and they all end up different! Well, that was a tricky job well done! Your patience never fails to amaze me!! Thanks!….each time I get one finished I say to myself “this is going to be the next one to quilt” But I really like this one so it just might be true this time! Wow, I give you so much credit for taking the time to finish this piece of history. 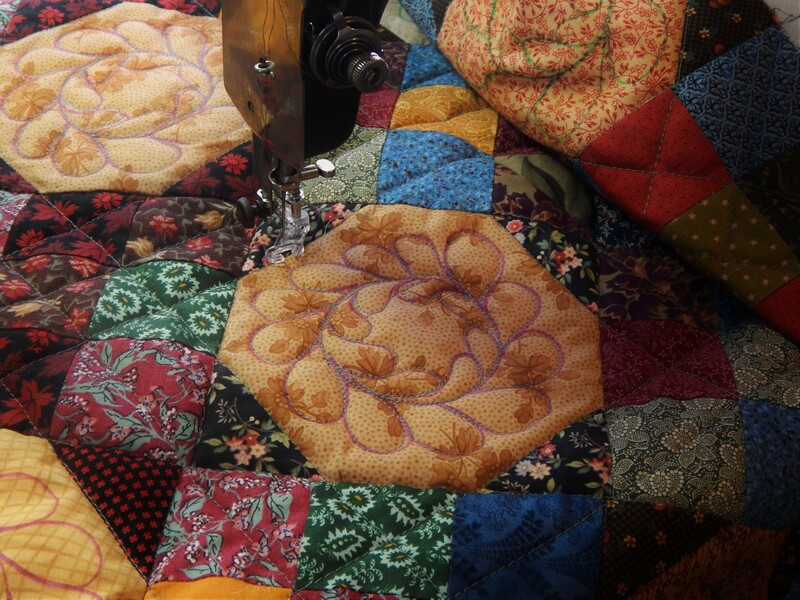 Your work is amazing, don’t ever stop quilting, you are a natural. Thank you!! I love doing it so I have no plans to stop!! 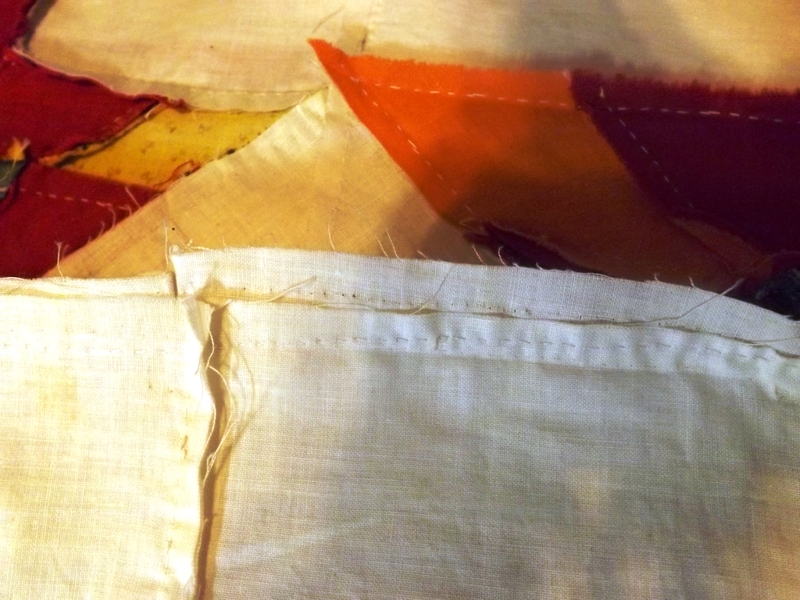 I need to wait to find just the right border fabric…but I am looking forward to quilting!